October is Down Syndrome Awareness Month. The first thing I delved into after Ari was born, was the genetic component. I wanted to know, why and how did this happen? If you enjoy science, then read on. I put the information I found in the book, "Babies with Down Syndrome" into my own words. I want to make sure I credit Chahira Kozma. If you wish to have more detailed information, she does a wonderful job explaining. Our genes are made up of our DNA, and they tell our body what to do. Chromosomes are the package that our genes come in. Normally, each cell in our body contains 46 Chromosomes, or 23 pairs of chromosomes, one chromosome per parent in each pair. 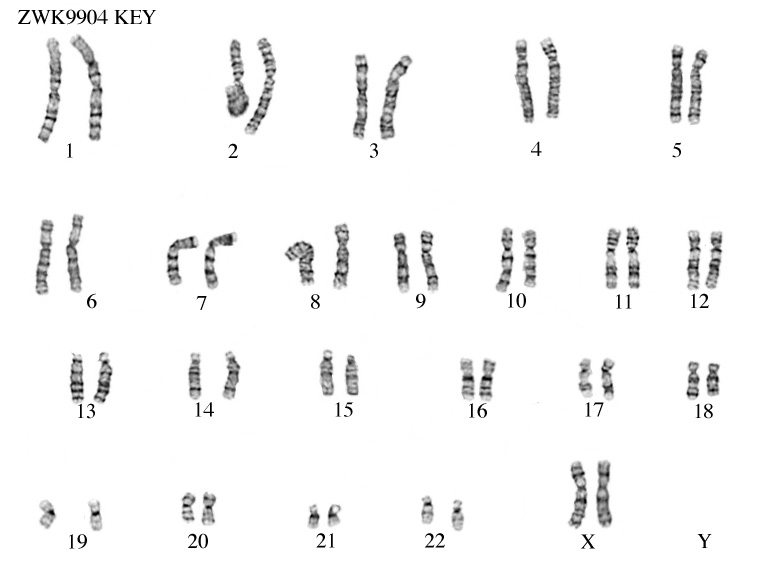 This is a karyotype, which is an image of the chromosomes in a cell. 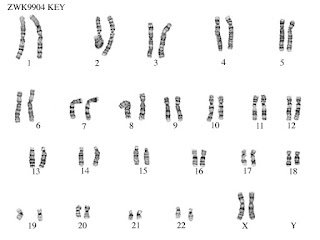 The chromosome pairs are numbered according to the amount of genetic material that they hold. The first chromosome pair contains the largest amount of genes, and the 21st holds the least (they used to believe that the 22nd held the least, thus it is incorrectly numbered). At conception, a baby is formed by the combination of 23 chromosomes from the egg and 23 from the sperm. The cell, now containing 23 pairs, or 46 chromosomes, begins to replicate itself, with each new cell containing the exact same information. So how is it that the sperm cells and the egg cells only contain 23 total chromosomes? They go through a process called meiosis, which splits the pairs of chromosomes so that the baby can receive one chromosome from each parent. It is during meiosis that most errors occur. In nondisjunction, the cell that splits to form the egg or sperm (46 chromosomes) may split improperly and result in two eggs containing 22 chromosomes and 24 chromosomes, respectively. The one with 22 chromosomes could not survive/be fertilized, because it is missing an entire chromosome. The one with 24 chromosomes can survive, but it brings an extra chromosome along. When the egg is fertilized, the cell now contains 47 chromosomes, one of the chromosomes having a third copy instead of the usual pair. This is called a "trisomy." 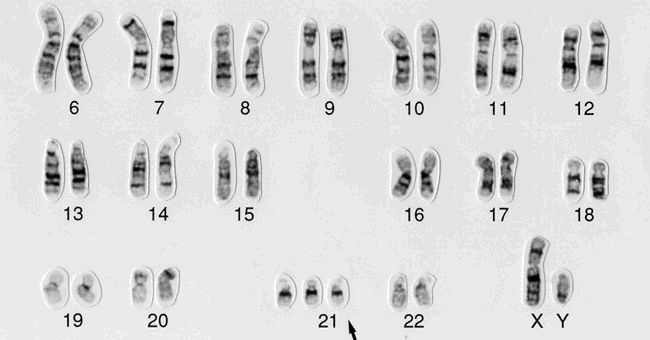 If the extra chromosome is added to the 21st pair, this is Trisomy 21, or Down syndrome. The cells then duplicate until every cell in the body contains 47 chromosomes, instead of the typical 46. Nondisjunction results in the the most common form of Down syndrome (95%). Below is a karyotype of a male with Trisomy 21. In translocation, which is harder to explain, a mother or father's cells have a rearrangement or chromosomes, usually having two stuck together. When meiosis occurs, a piece of chromosome 21 breaks off and attaches itself to another chromosome, resulting in extra 21st material. Only 4-5 % of babies with Down syndrome have a translocation. This is also the only form of Down syndrome that is inherited. Parents of a child with type have an increased likelihood of having more children with Down syndrome. Mosaicism is found in 1% of babies with Down syndrome. Mosaic Down syndrome occurs when only some of the cells in the body have an extra 21st chromosome and the other cells do not. This can happen in one of two ways. 1. The cell starts out with 47 chromosomes and during the replication of cells, one of the dividing cells corrects the error. In this case some cells continue to copy the extra chromosome and the other cells copy the corrected cell (which now has 46 chromosomes). 2. The reverse of number one...the cell starts out typical and somewhere along the cell division, an error occurs. Cells from the original are copied and cells from the abnormal cell are also copied. People with Mosaic Down syndrome can often be less affected, both intellectually and physically; it depends on what part of the body is affected by the abnormal cells. Why is Down syndrome the most common chromosomal abnormality? Over half of all first trimester miscarriages are a result of chromosomal abnormalities. A baby will not survive if the cell contains an extra 1st chromosome, for instance, because this chromosome holds the most genetic information. The larger the amount of genes on a chromosome, the less likely the baby will survive. Of course, some babies do survive with many different genetic conditions, and the chromosome(s) involved determine the affect it will have on the baby and their quality of life. Because the 21st chromosome contains the least genetic information, it has the smallest affect on the person, and it makes sense that these babies have the greatest chance of survival and of living fulfilling and often independent lives. I love what Reeves Tees stands for. I love the fact that their products not only promote acceptance but that they are edgy too. I also love the personal touch that comes with each order. Not many companies do that, and I am glad Reeves Tees does it!